SEARCHING FOR A PART #? New Stark Insert Tooling Section! in the manufacture or millwork, furniture, cabinets, and store fixtures. Leadership in technological innovation is the cornerstone on which Wadkin was built. Now you can get the same level of quality products, fast service and competitive pricing for all of your tooling and accessory needs.  From the beginning, an emphasis on quality tooling has been an integral part of our total operations. We manufacture a wide range of tooling, tool room equipment and accessories. All backed by over a century of experience and expertise. 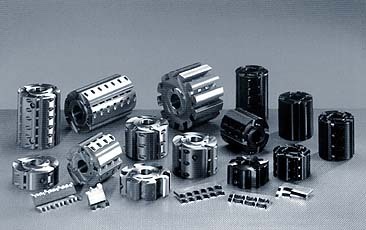  Our goal is to become your one source for tooling and accessories to be used on or with moulders and grinders. In order to assure all of your tooling needs are met, we compliment our line with specialized products from rigorously selected partners around the world.  Designed, engineered and constructed to exacting standards, the products in this catalog will enhance the performance of any manufacturer's moulder or grinder.  Let us know how we can help you today. Our Pledge to You . . .
We are dedicated to fulfilling your tooling, tool room equipment and accessory needs for moulders and grinders. We will constantly strive to meet or exceed your expectations for product quality, fast and friendly service and competitive prices. All of our products, whether manufactured by Wadkin or by our select partners, are 100% guaranteed. Most products are available from inventory and can be shipped immediately. Wadkin North America, division of Wood Tech Enterprises, Inc. is not responsible for typographical errors.h America has welcomed visitors to our website.